As Uganda continues to fade off the threat of counterfeit drugs and diagnostic gears, the Indian High Commission and Pharmaceuticals Export Promotion Council of India (Pharmexcil); with the help of [PMA] Pharmaceutical Manufacturers Association and [PSU] Pharmaceutical Society of Uganda has organized a Pharma-Business Meet with a delegation of over 45 companies from India. 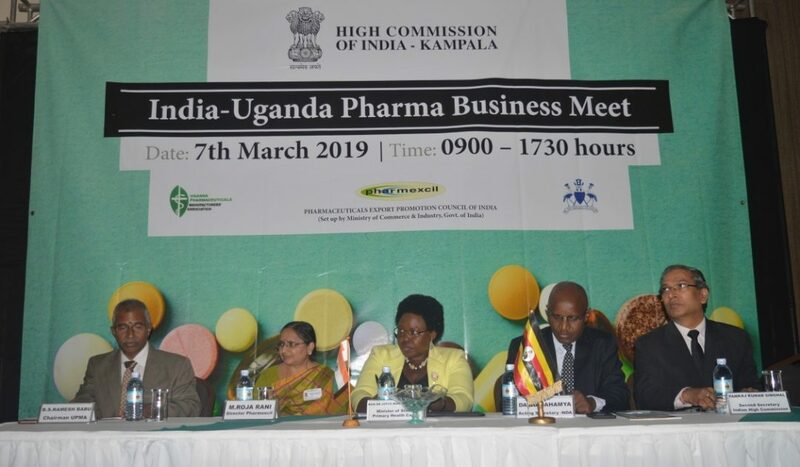 The business meet is intended to counter phony medical products and break a ceiling with local pharmaceutical dealer as India and Uganda continue to improve business relations in the pharma market. Barcoding was introduced by Indian Government for all pharma export consignments to ensure supply of genuine drugs to the world markets. India’s Pharma industry serves the needy with responsible care and is in the midst of a very noble cause of providing competent medicines and medical gears at the most affordable prices. Governments and Insurance payers all over the world are trying to utilize every opportunity to employ generics to stretch their currency to an extra mile. Over the years India’s pharma industry with a steady flow of Pharmaceutical chemistry skilled work force with highly enlighted market management strategies could become an important source of Pharmaceuticals. India exports consist of 75% of finished dosage forms is an endorsement of its ability to turnout high quality generics. India holds over 4325 Market Authorizations from USFDA and has over 700 manufacturing units being inspected By USFDA which is the highest number outside of USA. Yet another agency EUGMP has certified over 740 manufacturing sites. India holds over 1950 market authorizations from UKMHRA. India exports to almost every country and its exports stood at US$ 17.27 bn during 2017-18 and about 19.5% of its exports are to Africa Region. India’s pharma exports (comprising APIs, finished formulations, Herbals, surgicals, Vaccines) in 2017-18 were to the tune of US$ 155.82 million.